What does it all mean and why do we strive? annual trips with blankets and clothing to donate to them. Their plight then was very bleak. It seems that it has not improved much in 20 years. There are somewhere between 50,000 and 70,000 people who live in the Copper Canyon. The exact population is unknown because the Mexican government does not count them. Three native Indian tribes make up the population in the Copper Canyon: Tarahumara, Pima and Yaqui. Each tribe has its own language. 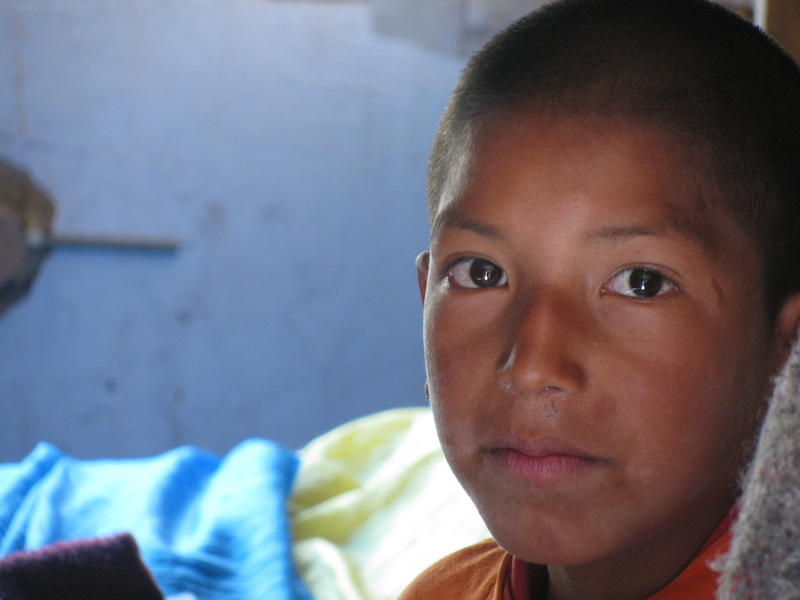 The Tarahumara alone have 5 distinct dialects which can make communication among their own tribe difficult at times. They prefer the name of their own language, Raramuri (“those who run fast” or “runners on foot”), and are known for running very long distances. Living isolated and deep in the canyon has helped them preserve their culture, language and music. The Copper Canyon is over 25,000 square miles or 4 times larger (some say 7 times larger) than its sister canyon, the Grand Canyon, in Arizona, U.S.A. The Sierra Tarahumara is actually made up of 6 large canyons with rivers that feed into the main part of the canyon and the Rio Fuerte which empties into the Sea of Cortez. 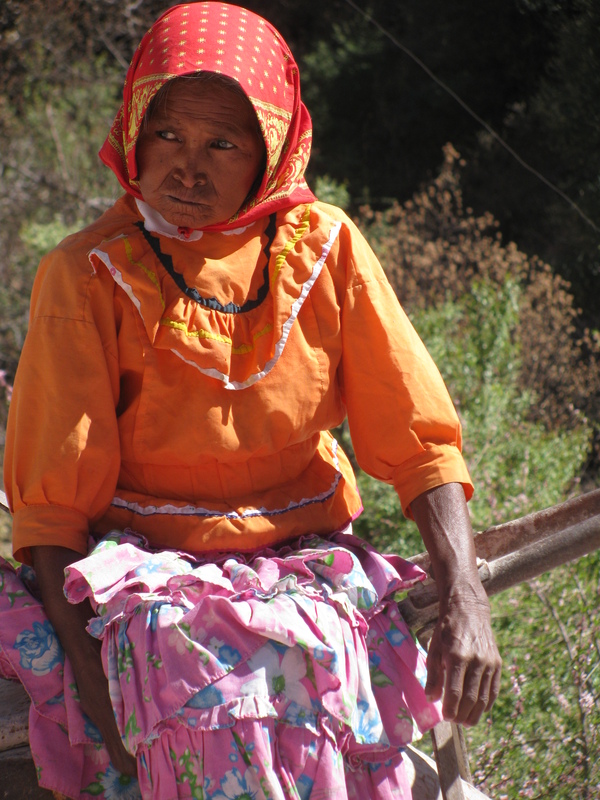 The remote and rugged nature of the area isolates the Tarahumara and makes getting help to them very difficult. This area of Mexico has been under a drought for the past several years. 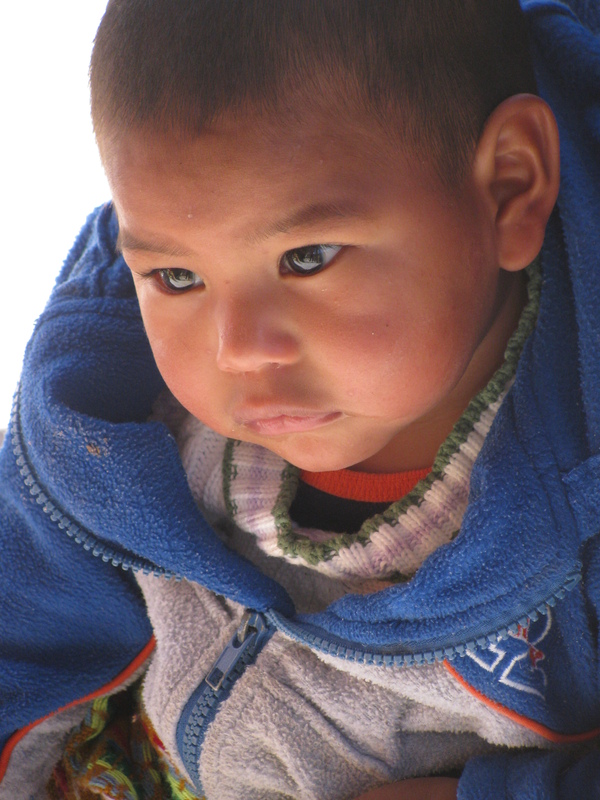 This has made the bleak living conditions of the Tarahumara and other Indian tribes very difficult. Death from hunger is a very common occurrence. The infant mortality rate is 50%, mostly due to nutrition issues. The high elevation (8,000 ft) and cold winters can also bring its own misery. The winter of 2010/2011 was particularly bitter and reports of children freezing to death were regularly heard. There are a number of different non-profit organizations and Christian ministries at work attempting to bring relief to different parts of the Copper Canyon. My church, Central United Protestant Church (UMC), in Richland, Washington, partners with Tomas Bencomo and Tarahumara Ministries based out of El Paso, TX., and Juarez, Mexico. We have had Tomas and Maria Bencomo and their co-worker and translator, Brenda Granados, to a few of our missions conferences, which we call Global Impact Celebrations. Our team flew into El Paso, TX, and stayed at the Micromotel right next door to the airport. We spent the night and then got up early in the morning and rode to a little village 8 hours south called Rio Chico. Rio Chico is the staging area for humanitarian trips into the canyon. It also has an experimental farm to train Tarahumara farmers. Another experimental farm is located in Rio Bravo about 12 miles away. These help train farmers in better farm methods. After a season, the farmers are sent back home with seed and a steel plow that can be pulled by a mule. The first few days were spent planting 200 fruit trees and digging and pouring a foundation for a small building. This was done all by hand with broken shovels and picks. So, it not only made for hard work but also frustrating work. The elevation of Rio Chico (about 7,000 ft) made the work seem even more difficult from us lowlanders. We joined a group at Rio Chico from Montana, Wyoming and Minnesota. So, at least we had plenty of hands to do the work. Still, those few days produced sun burns and lots of blisters and sore backs. Finally, we loaded up to go down into the canyon with a supply of food. We took a large four-wheel drive box truck and a four-wheel drive Chevy Suburban. 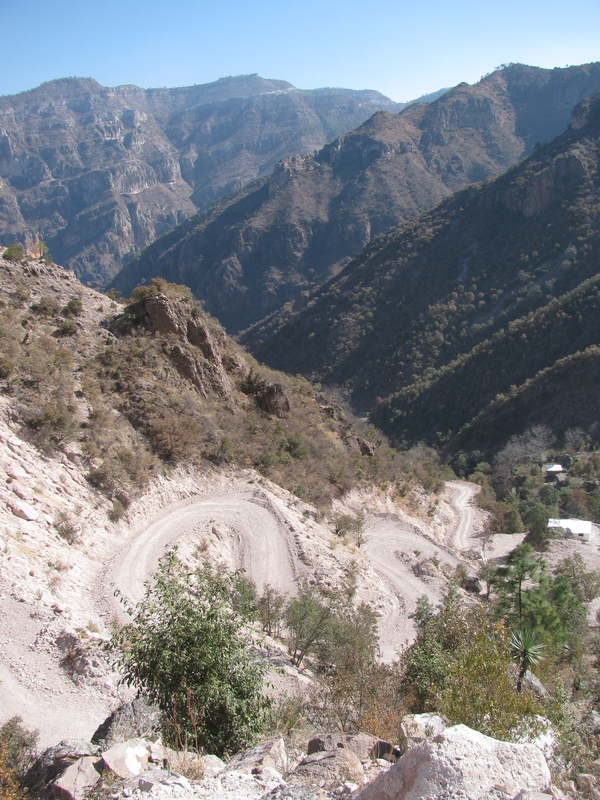 It is a 10 hour ride from Rio Chico down into the Copper Canyon where Tomas Bencomo and his team have a boarding school. It serves about 300 families. It takes 4 1/2 hours to travel the last 60 miles of dirt road. The last 2 1/2 hours is descending 20 miles into the steep canyon by a steep twisting road with 31 hairpin turns. They are so sharp that the driver must stop in mid-turn, backup and finishing the turn. Fortunately for our driver, we descended it at night so he did not know what he was facing as the headlamps of the Suburban shown out into the pitch black night. good to get out. The night sky was brilliant with a splash of stars, but only the narrowest portion of the sky could be seen as the walls of the canyon pinched the night sky. It would not be until morning that we would gaze up the steep canyon wall and be amazed at what we had ignorantly descended in the dark. We all agreed that we were glad we had done it in the dark. Some of us may have gotten out and walked down the road otherwise. The morning was clear as we made our way to the main boarding school. Out buildings were scattered all along the sides of the canyon, which meant that almost everyone had to move up or down its walls. Level ground is a precious commodity reserved for buildings and gardens. The sounds of chickens and children filled the morning air around the school where 80 – 90 children are housed and fed. A government teacher comes in, when she can make it, to provide education at a small building close by. This week, apparently, she was not able to make it. distances to get there. Parents send them because they know that their children will receive food and an education. A few of the mothers come with their children and help in the kitchen and with other duties with the children. They are paid with food to take home on the weekends. Typically, children head home on Fridays and return late Sundays for a new week. The ages range from a couple years to almost 6th or 7th grade. After that age, there are no other resources for the children. Many of them go to work. One young brother and sister there had been rescued last Fall from starvation. The family could no longer feed the 1 and 2 year old boy and girl. So, they asked another family to take care of them. However, that family too finally came to the heart wrenching decision that they, too, could no longer feed these two and feed their own kids. So, they were placed in a corner, covered with blankets, and left to die of starvation. One of the workers at the children’s home heard about it and went to see what she could do. She encouraged the family to give the children to her to feed. They were somewhat reluctant because they were afraid of the social stigma that may accompany when others find out about their plight. After much coaxing, the two youngsters were given to her. She drove the 4 1/2 hours over the rough dirt road to take the children to the nearest medical clinic. While we were there we had the joy of holding these two lively kids. They were full of life and joy. 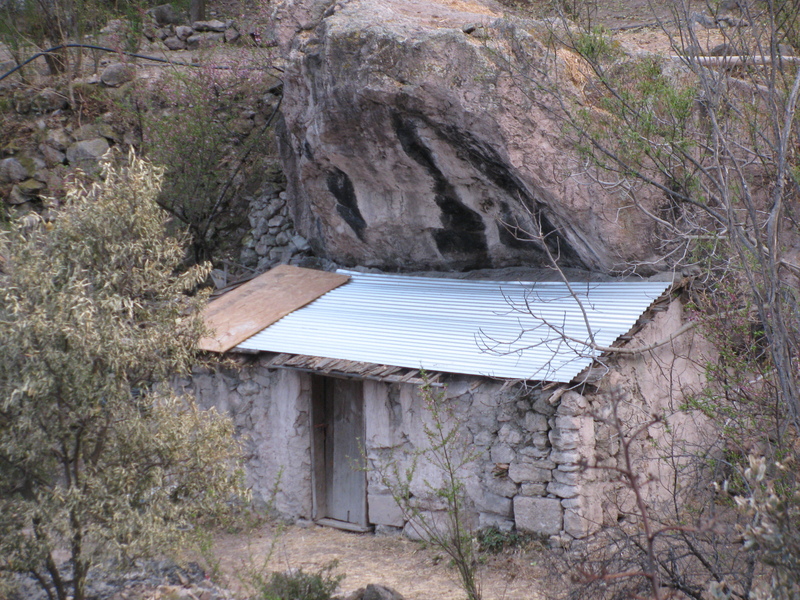 This is one story among many that reveals the importance of this type of service to the indigenous people of the Copper Canyon who are locked in poverty. Our team passed out bags of groceries that families were able to take home. The food was available to everyone and anyone who came to receive. The week’s worth of food, which many of them would attempt to stretch into a month, was gratefully received. 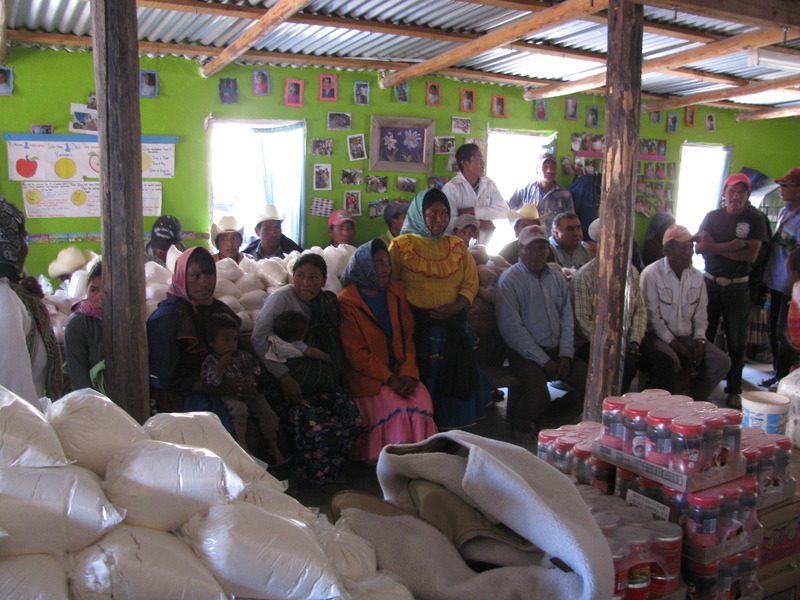 Women received food first and then the men who had come received food for their families also. There are no shortcuts out of the Copper Canyon. A train rides along the rim from Chihuahua to the Pacific Ocean. For most of the residents of the canyon, the only supplies available are those that the hike out to receive and then pack back in to their families. Some, a few, are fortunate enough to have a burro to help with the chore. Most, however, continue to live as they did when the Spanish Conquistadors pushed them into the canyon 500 years ago. So, we climbed back into our vehicles glad that we did not have to hike out of the canyon. Instead, we bounced along for 4 1/2 hours until we got to a paved road, that led to the town of Creel that brought us to a good road back to Rio Chico. After 10 hours on the road, we fell into our sleeping bags exhausted only to get up early the next morning for the 8 hour drive back to Juarez and El Paso. It would be good to get home. The illusion of short-term mission trips is that one has experienced fully what it means to be embedded and fully embraced in a mission project. However, nothing could be further from the truth. We were returning home. We would go back to our routines in our American suburbanvilles. The ones we were leaving behind would continue the work. On Sunday, the next day, Tomas would preach a 7 am service in Juarez, an 11 am service in El Paso, and another 3 pm service in Juarez. Then, Monday morning, he and his team would take the long torturous road back to the land of the Tarahumaras. And do it all over again.